Day 1/90: Scan results are in! A video tells all the story: please watch listen and stay engaged with me as i move forward. There is much still for us all to do and comprehend. 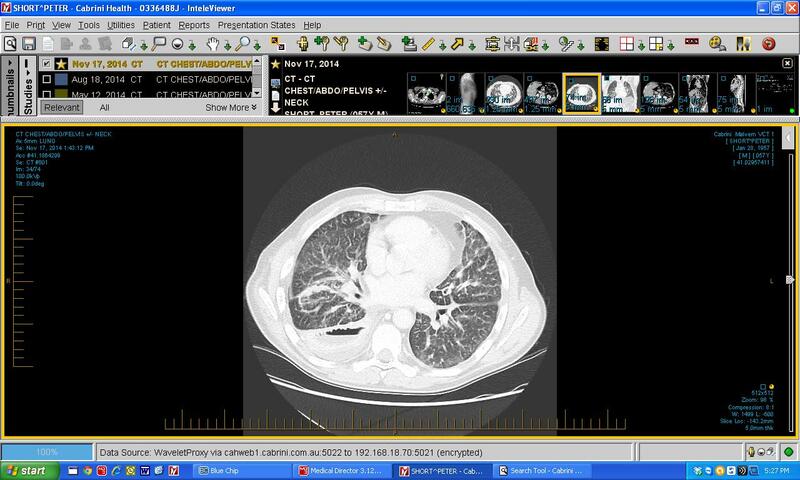 This is the scan, you need to be a doctor to get much out of it, but all the white bits in the lungs are cancer, yuck! This is the great thing about my blog, you all can bet up-to-date and I feel this is important for my friends to all know. Hi Peter ,shedding a tear or two knowing what your going through , the roller coaster life for both of us continues ,its just your in the carriage ahead of me !!! Thumbs up ! stay brave and positive I’m with you along with many thousands. Thanks, no tears allowed:) Never know, I will try and slow my carriage down so yours backs up to hey. Agree – Yuck. You’re approach and desire to keep everyone engaged and supportive for yours and our sakes is truly amazing. I love you for it. Stay positive and know you have us with you. I am so sorry Peter, I just feel like crying for you but that is not going to help you. You are just so amazing and courageous. I feel very privileged to have “met” you. No need to cry, I find playing that Lion King song the Circle of life a more fun way to go. Thats a good idea but I think many others will share a chunk of final success. Gosh getting so polite and inclusive am I not . And you know what I can feel and feed on it. Weird hey. My Aunt Jan was saying they are still burning candles every week in her Church for me, and even though I am not religious it is the thought and positive energy that comes for these things that is astounding. The whole cancer journey really has been me meeting tons of inspirational people, reality is they are everywhere we just don’t walk eyes open most of the time. Good for you Peter.. You’re an absolute inspiration…but then you always were. Keep doing what you’re doing & sending very best wishes to you and your family. Thinking of you Pete, missing you all over here! Keep the videos coming. Freezing in the snow me thinks! All the best to you Peter, you are up against it big time but what a legacy you are leaving. We know the public want the choice, we just need the politicians to get their act together. I will keep pushing, every poll says act. Thanks for the help and posts and interest. Peter, you are an inspiration !! Still thinking of others at this time in your journey and still so committed to the cause. We salute you. You have achieved so much already. Keep strong !! See you on day 91. thank you so much. Thanks. Big test in Vic this weekend hey. Peter, so sorry to hear this update. You have come this far and I have no doubt you will do everything you can to get to day 91. Your strength continues to be an inspiration to the many people who have met you in your life.